Home Ask the Docs A New Way to Protect People from Falling? A New Way to Protect People from Falling? Osteoporosis, falls, and broken hips are one of the biggest concerns of people 55 and up. The fear is real and justified, as falls are a leading cause of death and disability once you hit the age of 60. To combat this, conventional wisdom has suggested that older adults focus on increasing calcium, taking bone-hardening drugs, and to keep monitoring your bone scans. This isn’t to say that bone density is unimportant. Bone density is really important! But bone density is REALLY, REALLY, REALLY hard to change once you’re at the age of risk. Your only source of protection are drugs like Fosamax. The problem with that is that bone-hardening drugs like Fosamax have come under scrutiny for waning effects after 3-4 years. Once you have osteoporosis, you are basically going to have it throughout your life. It’s not like you can just take the drug for 3 years, stop, and still be protected. You are expected to take this drug for the rest of your life, but doing that will increase your fracture risk. It’s just one of those ironic moments in medicine when the cure can eventually cause the problem. The best time to address bone density problems is likely in early adult hood. Resistance training combined with a diet high in calcium and magnesium can help build thick and strong bone during your 20’s and 30’s. Trying to build bone in your 50’s and 60’s as a post-menopausal woman can be a losing battle. For many, it’s way too late to try to increase bone density naturally. However, there is more to blame in for the devastating impact of falls beyond just soft bones. We also have to look at why people fall to begin with. 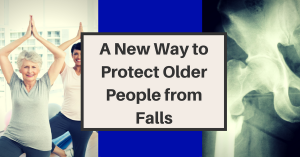 Research suggests that just 15% of falls occur due to some external event (wet floor, pushed over, etc) and 15% of falls are a result of an underlying disease process (MS, diabetes, epilepsy). That leaves a whopping 70% of falls are a result of a combination of factors that lead to poor balance and poor mobility. Unlike soft bones, balance and mobility are traits that can be trained and improved upon throughout your life. When it comes to balance, you have to address 3 parts of the nervous system. 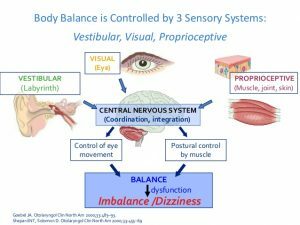 The visual system, the vestibular system, and the proprioceptive system. For ease of understanding, we’ll just call them your eyes, your ears, and your joints/muscles/skin. These are the most commonly prescribed recommendations for people with balance problems. But what if these therapies don’t work well for you? Many people are told that they just have to live with their balance issue. A recent study published in the Journal of Manipulative and Physiologic Therapeutics suggests that chiropractors may play a large role in helping people get their sense of balance back. The study looked at 30 patients receiving chiropractic care versus 30 controls. 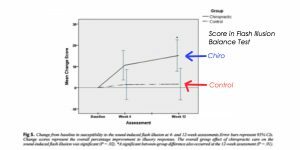 Both groups had measurements taken of various balance metrics and were tested at 4 weeks and 12 weeks. The patients in the chiropractic group had a significant decrease in errors in joint position tests. Patients in the chiropractic group had higher scores in a sound flash illusion test. 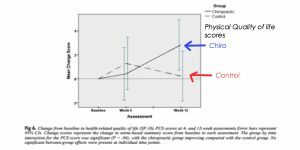 Patients in the chiropractic group had a significant improvement in health-related quality of life scores. So here’s the thing. The results look good on the charts and seem to be significant. However, we can’t really make the leap that people will fall less by getting adjusted based on the results of this study. It’s just a good place to start. What this study does tell us is that there’s something about patients who get adjusted seem to have a better sense of their own body. That’s the proprioception idea that we talked about earlier. If you have a better awareness of your body, then you will generally have better balance. 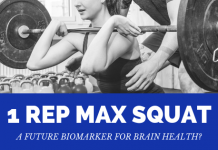 While we can’t make a leap based on this study, we do know that many patients under chiropractic care see some astounding changes in their balance and quality of life when they start getting their brain and spine connected. I am a 72 y.o. retired R.N. with history of Vertigo and Poor Balance. Having had this problem for more than 20 years; I have seen many Doctors with little or no improvement. On April 11, 2014, I walked into Dr. Chung’s office holding onto walls or anything available to keep from falling. After my first visit, I knew that I had finally met someone that truly cared. After my first adjustment, I was able to stand on my own. Fast forward to 12 weeks of treatment, I am now able to go out without fear of falling. I am now on the Maintenance Program and feeling stronger and able to “LIVE” and not merely :SURVIVE”. Many doctors didn’t go into chiropractic because they want to be a quick solution for pain. They went into chiropractic because it can dramatically change the quality of someone’s life. When you lose their sense of control over their surroundings, it can become devastating to your sense of independence. Our job is to find a way to give that sense back to you. Dr. Chung is a practicing Structural Chiropractor in the West Palm Beach area. 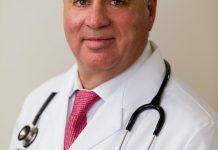 He has been published in peer reviewed scientific journals and is a sought after speaker in health and wellness. Follow his blog at http://chiropractorwellington.com/category/keystone-chiropractic-blog/ or find him on twitter at @drjonathanchung. 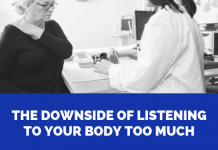 Listening to Your Body Too Much?